The Krotons, Robert Holmes' first Who script (admittedly one which was developed by Terrance Dicks from an idea that had nothing to do with Doctor Who) gives little indication of the high-class, witty and gripping work for which he would ultimately become famous. 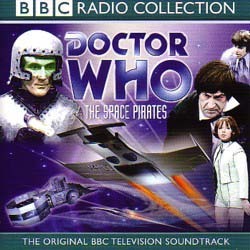 The Space Pirates, also from the sixth season, isn't much better, although it does contain the earliest example of Holmes' sense of humour, in the character of Milo Clancey. Clancey, played by Gordon Gostelow, is an eccentric ore prospector based upon the gold-rush explorers of the Old West. With his decrepit spaceship, the controls of which often need a hefty thump to get them working, and with little respect for the rules and regulations of this home world, he is also reminiscent of the Doctor himself. When several scripts fell through in rapid succession, The Space Pirates was expanded from four episodes to six to help fill out the season, and frankly the padding is noticeable. The story drags, particularly during the final three instalments. And it is fairly obvious, from Episode Two onwards, as to which character is in league with the pirates. However, nothing starring Patrick Troughton is ever a complete waste of time.